Vladimir Putin's Russia is a disaster of a declining population, corruption, authoritarianism, a warped economy and a high rate of alcoholism. Doesn't Russia have enough land for its diminishing population? Are there not enough minerals, timber, gas and oil for Putin's kleptocrats? In the modern age, especially since Karl Marx, we rationalize the causes of wars as understandable fights over real things, like access to ports, oil fields, good farmland and the like. Yet in the last 2,500 years of Western history, nations have just as often invaded and attacked each other for intangibles. The historian Thucydides wrote that the classical Athenians had won and kept their empire mostly out of "fear, honor and self-interest." Maybe that was why most battles in ancient Greece broke out over rocky and mountainous borderlands. Possession of these largely worthless corridors did not add to the material riches of the Spartans, Thebans or Athenians. But dying for such victories did wonders for their national pride and collective sense of self. Why did the Argentine dictatorship invade the British Falkland Islands in 1982? The great Argentine novelist Jorge Luis Borges dismissed the entire Argentine-British dispute over the isolated, windswept rocks as a pathetic fight between "two bald men over a comb." Taking the "Malvinas" apparently was critical to restoring the Argentine dictatorship's lost pride. In contrast, the descendants of Lord Nelson were not about to allow a few peacock generals to insult the honor of the British Royal Navy. Doesn't China have enough land without starting a beef with Japan over the uninhabited Senkaku Islands? While there may be some oil in the vicinity, apparently both sides see these desolate mountainous islets as symbols of more important issues of national prestige and will. Lose the Senkaku Islands and what larger island goes next? Saddam Hussein had enough land without invading Iran in 1980. But his impoverished Iraqis grew terrified of revolutionary Shiite Iran and lashed out. Iraq also had enough oil without taking Kuwait in 1990. But occupying it made Iraqis proud at home and feared in the Middle East neighborhood. The Obama administration has tried to psychoanalyze Putin as lashing out because of weakness. Or he is supposedly an unruly kid cutting up at the back of the classroom. Or he is acting out a tough-guy "shtick," as President Obama put it. Maybe. But it would be wiser to review the historical causes of war, especially why conflicts break out. Aggressors often attack their weaker neighbors to restore a sense of pride. They calibrate self-interest not so much in getting more stuff as winning greater honor, feeling safer and instilling more fear. Bullies such as imperial Persia, Napoleonic France, imperial Germany, Hitler's Third Reich and Stalin's Soviet Union did not really believe that their peoples would starve without annexing someone else's lands. Despite their pretexts, these empires all privately knew that they had sufficient living space. These autocracies acted out emotionally satisfying ideas such as crushing an upstart weak Greece, or extending French culture across Europe, or reminding European states that the proud German Volk was as superior as it was underappreciated, or reassuring Russians that the New Soviet Man was at last safe, respected and feared abroad. Just as importantly, history's aggressors embraced their fears and sense of honor because they thought they could get away with doing so scot-free -- given the perceived loss of deterrence. 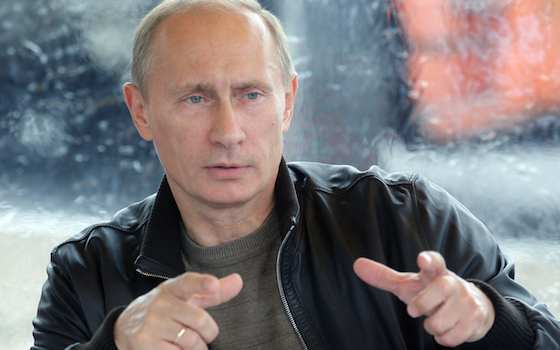 Putin, like Hitler in 1939, may be weak in geostrategic terms. But as long as he does not provoke an American and European collective response, he can assume that Russia is far stronger than any one of his next targets. Like Hitler, Putin does not know exactly which future aggressive act will prompt an American and European reaction. But until then, he is willing to continue gambling that he can restore some more of the lost empire of the czars and commissars -- and with it more Russian honor, influence and pride -- without consequences. If history is any guide, these emotions are driving Putin to grab things that are not his. Putin acts now because in the era of failed reset diplomacy and recent empty American deadlines, red lines and step-over lines, he feels the old U.S. deterrent is absent or dormant. And he will keep up his aggression until he senses that the increasing risks no longer warrant the diminishing returns of absorbing his neighbors. We should stop trying to psychoanalyze Putin, arguing that he is really weak or is an adolescent showing off his machismo -- much less that he has legitimate grievances. Instead, Putin believes that the more he grabs from others, the prouder his otherwise downtrodden citizens will become, the more respect they will earn abroad, and the less likely others will fool with him. Until that is no longer true, Putin will continue. "What do the Putins of the World Want?"